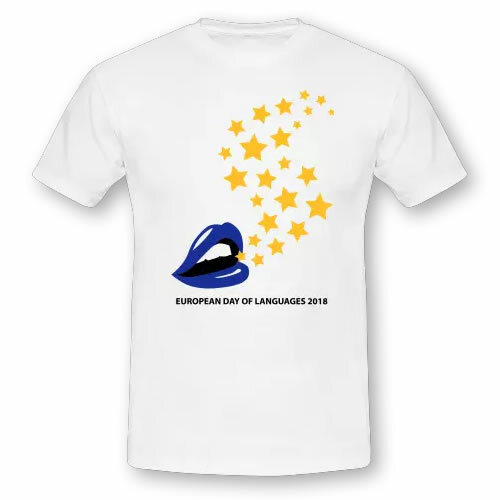 The following T-shirts can be ordered with our partner spreadshirts.com for the 2018 European Day of Language. We have chosen flex print for the print quality. I received the t-shirts last Friday. The quality is amazing! You have chosen a very high quality fabric. Most white t-shirts are more or less see through, and these aren't. Well done! Send us your design/image/graphic and have your layout on the official 2019 EDL T-shirt! The winner of the 2018 EDL T-shirt contest is Emily Van Cantfort from Belgium. Congratulation! "I first studied graphic design and then started studying office management. As part of an assignment at a language exchange, we held our own competition for the best t-shirt design. I eventually won this, so I decided to also take part in the real competition. Luckily!"